KELSO, Wash. (KOIN) -- A memorial outside the Cowlitz County Hall of Justice continues to grow just feet from where officers are making plans to honor Deputy Justin DeRosier. The 29-year-old deputy was killed late Saturday, the first deputy in the county's 165 years to die in the line of duty. He leaves behind a wife and a 5-month-old daughter. One day after a procession brought his body from Vancouver to Kelso, people brought flowers, meals and their grief to the Cowlitz County Sheriff's Department. Some said they're working through their grief as they follow the ongoing investigation. The president of the Behind the Badge Foundation, Sgt. Brian Johnston, said the community knows "these officers, these deputies by name, by face. And not just once or twice, so there's that personal sense of loss each one of us feels." Johnston said Behind the Badge is coordinating with agencies in Washington, Oregon, Idaho and British Columbia. "When we have a law enforcement officer's death, we can count on several thousand people who want to be part of that," he said. Memorial plans and funeral arrangements are pending. Flowers, cookies, hugs and back rubs. All day long, people keep dropping by the @SheriffCowlitz offices to share their support and grief, remembering Deputy Justin DeRosier. "They're trying to process the whole scenario," Kelso resident Lisa Alexander said. "It's just sadness." She said there's no way to answer the question of why. "There's no answer to that. he's gone - they're both gone. There's no way to answer why." Alexander said that when she's stressed she bakes. "We got together, my oldest granddaughter and my youngest grandson helped me, and we baked. We're delivering 2 dozen cookies to each department from Kalama to Kelso, and I wish I could go further." She also said a meal train is already full through July. "The community's coming together. This is what our community does. All I wanted to do was help." Patrick Palmer, who co-owns Copies Today in Kelso, is printing and handing out free "Back The Blue" stickers to anyone who wants them. The death of Justin DeRosier impacted more than just his family. The close communities of Kelso, Longview and Kalama are at a loss of words over losing the 29-year-old. To honor DeRosier and help his family Red Leaf Organic Coffee created a fundraiser, including donation jars at all their locations. 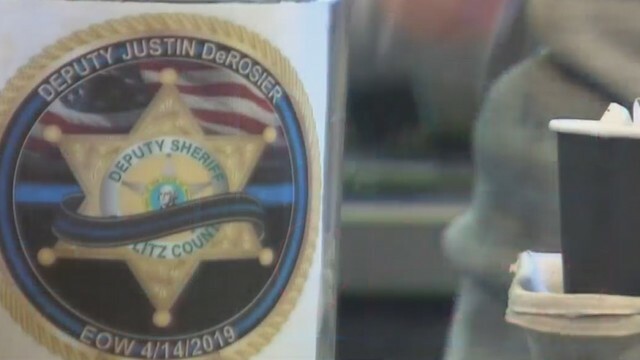 Cowlitz County Deputy Justin DeRosier was killed in the line of duty. To support his wife and 5-month-old daughter, @redleafcoffee in #Kelso is taking donations today—and hosting a fundraiser here tomorrow. "Cowlitz County is very tight-knit and when something happens to one of us, it affects us all," owner of Red Leaf Ray Vandervalk said. The donation jars will help the DeRosier family with expenses. On Wednesday, Red Leaf will also donate 20% of their proceeds to the family. In a Facebook post, the coffee shop said, "We are heartbroken over the news of the death of Justin DeRosier, a local sheriff's deputy who was killed in the line of duty. His family is near and dear to us at Red Leaf and he leaves behind his wife and 5-month-old baby girl. Words can't describe the heartache we feel, and we want to bless this dear family as they walk through this unimaginable time." According to Vandervalk, the town always comes together during tough times. "When there's a need and we can tell it's a genuine need, the outpouring of support is absolutely unbelievable," he said. Red Leaf regulars have opened their hearts -- and are more than willing to empty their wallets. "I'm going to give as much as possible because money can't, won't fix anything that happened," one customer Isaiah Akesson said. "It will definitely be helpful in what has to come." Akesson added that Deputy DeRosier was well loved and respected by many. After hearing about Red Leaf's fundraiser, Dutch Bros in Cowlitz County said they would also be donating 20% of their proceeds to the deputy's family. Tuesday night's City Council meeting in DeRosier's hometown of Kelso was an emotional one. People in the crowd grieved the loss of the young father, husband and friend. Lawmakers took time to remember DeRosier and reflect upon the impact he had on the community. "This tragedy showed me that I really can believe in Kelso," said Kelso City Councilwoman Kimberly Lefebvre. "He willingly and courageously stepped forward to accept the challenges inherent in the worlds 'protect and serve,'" said City Councilman Jim Hill. Kelso Mayor Nancy Malone took the opportunity to thank all officers. "Everyday that you walk out your front door, you put your life on the line for all of us and we all owe you of debt of gratitude for what you do for us," Malone said. Though the flags in Cowlitz County won't fly at half staff forever, DeRosier's legacy will never be forgotten. "We feel his loss," said Hill. "But his choice to follow that path will be forever inspirational in our community." Brian Butts, the man investigators said shot and killed Deputy DeRosier, died after Kelso police officers spotted him Sunday night. Investigators told KOIN 6 News those officers are being interviewed this week, one of 2 ongoing investigations into the case. An autopsy on Butts is scheduled for Tuesday night. The DeRosier homicide investigation is being led by the Clark County Sheriff's Office. Authorities expect to release more information later this week after identifying everyone involved in the shooting. Brothers Matthew and Michael Veatch are behind bars. Matthew Veatch appeared before a judge Monday. Court documents revealed he helped hide a gun Butts gave him and also helped Butts escape from officers.